If you know your full moon you will note it is bigger than often on March 19! As about everyone will have heard by now, the full moon of March 19 coincides with perigee and has thus the largest angular diameter in years. So will you note that fact by looking at it without optical help? Many bloggers, stories and even a NASA video tell you that you cannot and will notice a particular size of the March 19 full moon only because you either knew about it or because the moon illusion close to the horizon helps. But this is simply not true! Obviously these people have never tried for themselves - but this blogger did, inadvertendly and without knowing anything about its distance, when he watched the Feb. 17 full moon high in the sky and noted its unusual angular size. Then checking the ephemeris, the reason was obvious: perigee was close and the (topocentric) distance only 359,000 km! The full moon of March 19 will look exactly like that to the eye, so prepare for a beautiful show - and use it to e.g. try to see as much surface detail as possible with the naked eye. And if weather is bad, don't worry: The April full moon will be as close again as in February. So enjoy the show and forget about ridiculous articles like this or this, claiming links to natural distasters: even NASA responded; more rebuttals are here, here, here and here. The Sun made more headlines in the past 10 days, e.g. with a fine Aurora on March 10 in Northern areas following a flare late on March 9 (more, more, more and more), lots of sunspots in white light on March 8 and action also on March 7 (wavelength crossfade animation, fast CME, lotta flares). There were again general articles on solar activity and even an OpEd by science advisors - with the strange claim that "the severity of future [solar] storms could be much greater than those experienced in recent decades". And the SDO saw a partial eclipse by the Earth; the fuzzy limb is caused by the latter's atmosphere. 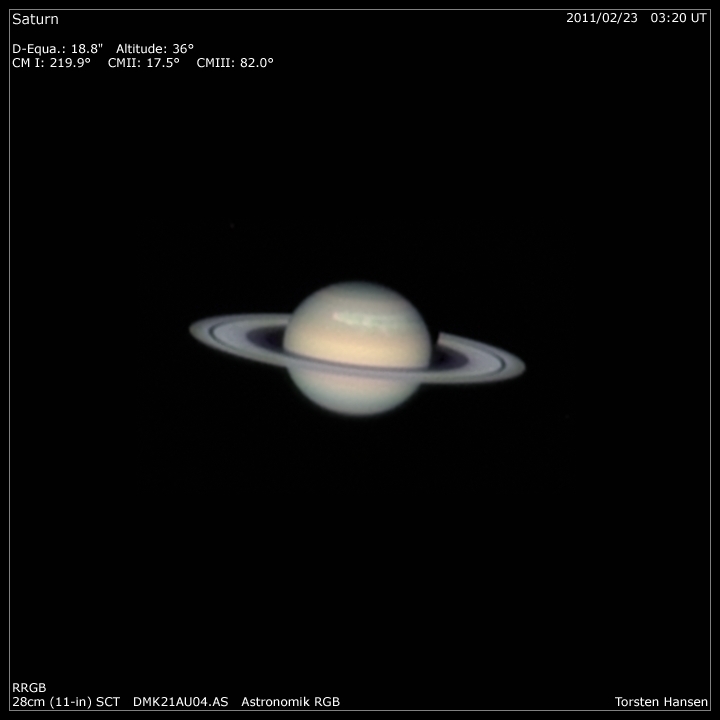 • Planet-wise some amateur pictures of the continuing huge storm on Saturn of March 14, March 12 and Feb. 23 (also animated) and Cassini close-ups of March 13 and Feb. 25/26. The return of Jupiter's SEB continues, and the planet met the Moon on March 7 (more and more) - when an amazing mosaic of the crescent was obtained by a Russian astrophotography wizard. The evening visibility of Mercury (close to Jupiter), seen on March 16, March 15 (more, more and more), March 14 (more, more), March 13 (more and more), March 11 and March 7/8; many more and still more pictures. In other news excitement is building for a large asteroid's Earth visit in November while harmless Apophis is observed again after a gap, themes for features on Lutetia have been approved and the spectra of the meteorites from asteroid 2008 TC3 resemble certain dust around stars. Also a fireball in Canada and a distant picture of Hartley 2. • The long eclipse of Epsilon Aurigae should end now! • A cool video & picture series of green flash of the setting Sun. • And finally the space shuttle Discovery crossing the Sun on March 7 (more) and the ISS and Discovery crossing the Moon the same day. Plus an impressive (this blogger saw it in binoculars: like a little comet dust tail!) water dump by Discovery on March 8 as an animation and still (more plus story); the phenomenon can also be seen in this wide-field animation and this still; it may also cause the fuzziness of the trail here. 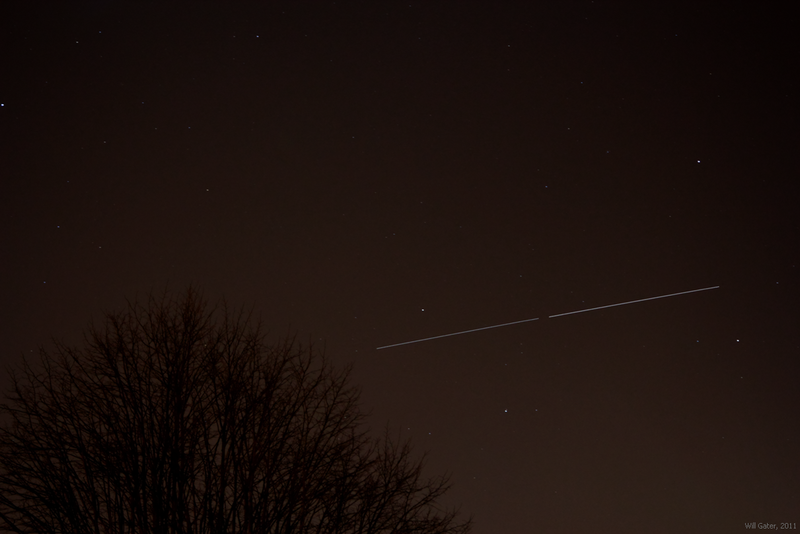 And finally some ISS/Discovery trail pairs and a very long exposure, some hi-res views and many more linked from this article by yours truly. 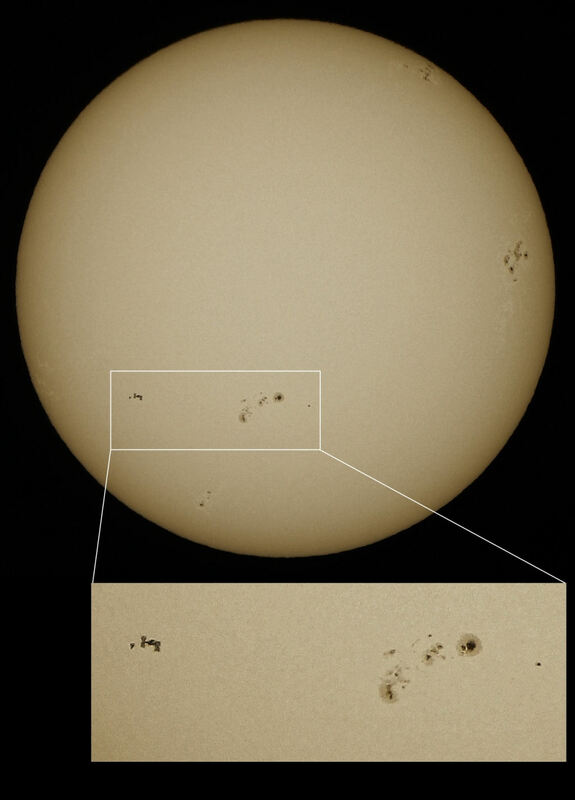 The best evening visibility of Mercury - for the Northern hemisphere, in 2011 - has just begun: The planet is still very close to the Sun but also very bright. In the coming days it'll fade but increase its elongation from the Sun (until the 23rd) - and on March 15 it will be only 2° from Jupiter which will help locate the elusive planet (which will receive its first artificial orbiter with MESSENGER on the 18th, by the way). This is clearly the main event of March 2011; for more see this, this and this story. 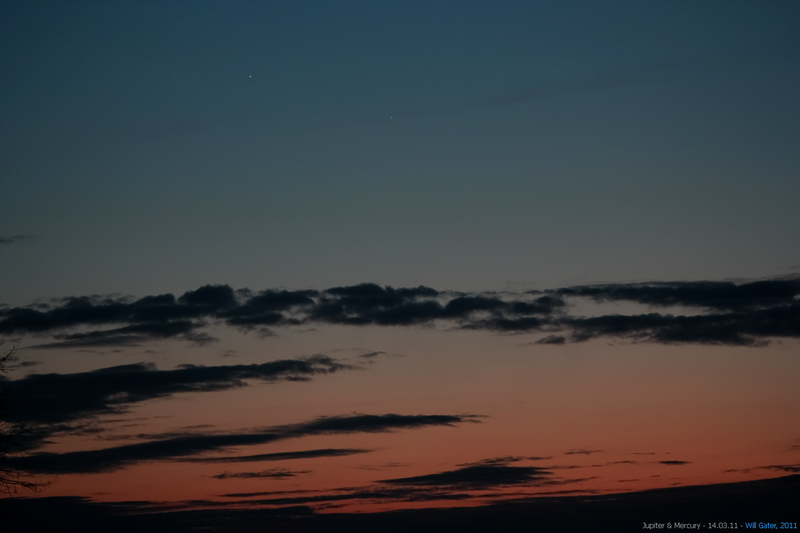 • There were already nice constellations in recent days: the Moon & Jupiter on March 7 (Germany; U.K., Moon close-up)and March 6 (U.K.; more, Moon close-up, Austria, Moon close-up, Germany, Moon close-up, more), Jupiter close-up on March 5 and Moon & Venus on March 1 from the Philippines, India (more), Germany, the Canary Islands (daytime), the U.S. plus more. 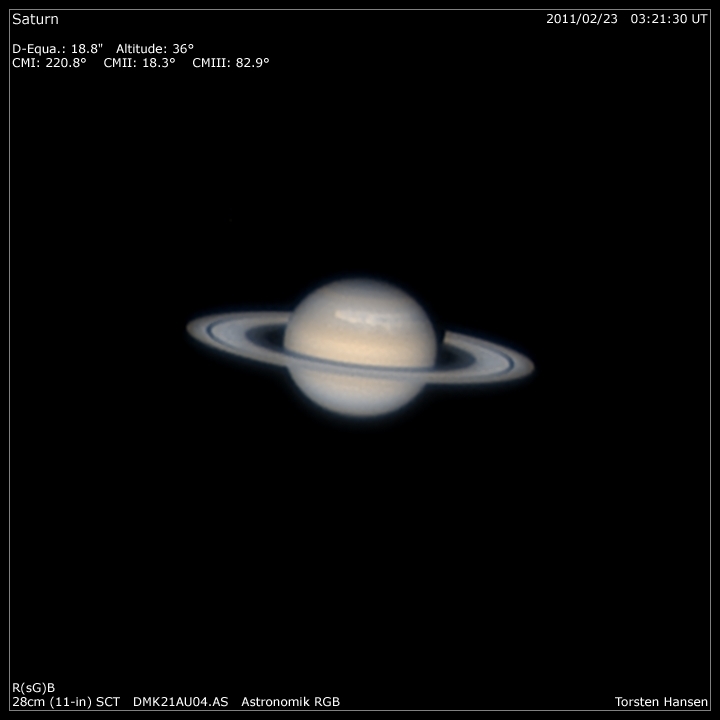 Also Saturn on Feb. 23 (movie). • Talking about the Sun, the SDO saw a funny partial eclipse on March 4 (more, more, more and more), there is a story on a little known Japanese eclipse flight during the last total eclipse in July 2010 in an Air Tahiti Nui magazine on PDF pages 33-34, and the weather analysis for the next total eclipse in Nov. 2012 in Oz has been updated. • The last flight of Discovery STS-133 has been amply documented by astrophotographers like Legault; other work is linked from this article. Also hot pics of Discovery and the ISS after undocking this evening from Germany (more and more) and one orbit later from the U.K. • Only sporadic observations of NanoSail are being reported, such as occasional flare pics and vids. • The AAVSO has received observation # 20 mio. (more). • And Leif Robinson has died (more).